Classic upside-down cake is delicious with any fruit, but bananas are so easily available year-round — which makes this recipe a perfect solution to the question, "what's for dessert"? Melt canola margarine in 9x9x2-inch cake pan, placed in a 350°F (175°C) oven for two to three minutes. Remove pan from oven. Stir in brown sugar. 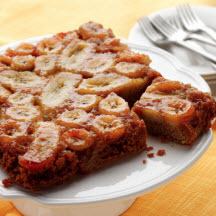 Arrange sliced bananas in a single layer in brown sugar mixture. Place egg, granulated sugar, banana chunks, canola oil, milk, vanilla extract and grated peel in food processor or blender. Process until smooth. In a large bowl, combine flour, baking powder, cinnamon, baking soda and salt. Add banana mixture to flour mixture. Stir until blended. Pour batter over bananas in cake pan. Bake at 350°F (175°C) for 25 to 30 minutes or until cake tester inserted in center comes out clean. Cool for 5 minutes in pan set on wire rack. Invert onto serving plate. Serve warm or cool. Best served on the same day. Nutritional Information Per Serving (1/12 of recipe): Calories 230; Total Fat 7g; Saturated Fat 1g; Cholesterol 20mg; Sodium 140mg; Carbohydrates 43g; Fiber 1g; Protein 2g.